The tradition wants that in the ancient times the Roman Amphitheater could seat up to 10,000 spectators. The entrance to the seats for the ordinary citizens was free and since the shows lasted several hours or days, at times, the spectators used to bring food and drink from home. The most common representations were the gladiator fights, usually carried out by prisoners or slaves, but there were also performances with wild animals and more rarely even mock naval battles. The arena had four entrances, among them, the Port Pompae for soldiers, the Libitinensis, consecrated to the goddess who presided over the passage to the afterlife, intended for those dead or wounded and the Sanavivaria for the winners and who were pardoned. The Roman Amphitheater was built in the late first century BC under the dominion of Octavius Augustus, later modified by Trajan. Together with the Arch of Trajan, they certainly represent the most important architectural works of the Roman period in Ancona. Hanging over the sea between the Colle Guasco and the Capuchins, its irregular shape uses the slope of the two hills to hold onto its impressive bleachers. Rediscovered in 1810, it was brought to light with the excavations of the Archaeological Superintendence of Marche in 1930. 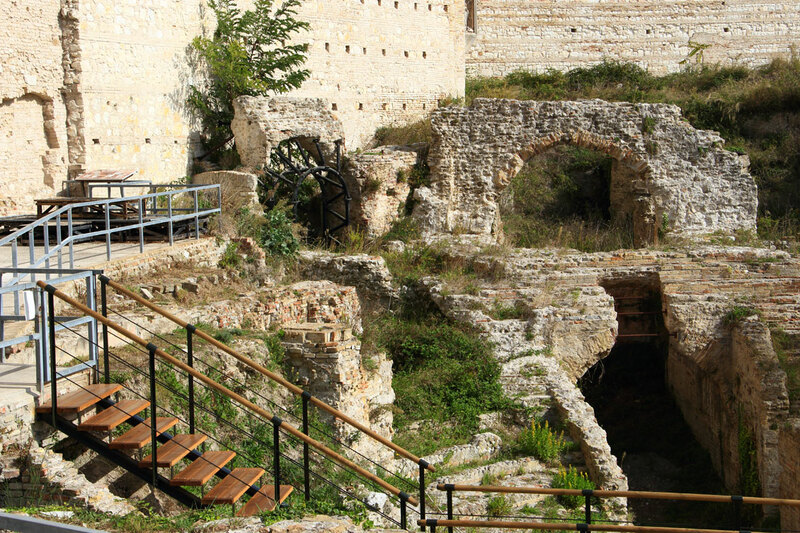 Today the Roman Amphitheatre is a charming place where to attend various performances from music to poetry.